1.2 Hammer Time (Break It Down)! 1.4 Our Personal Favorite – A Pepper Mill! Short Answer: Visit your local coffee shop and ask them (nicely!) to grind it for you! It’s something that coffee aficionados live in fear of. Okay, well maybe not fear, but finding yourself without a way to grind your coffee beans to make that magic elixir that helps jumpstart your brain in the mornings isn’t a happy situation. There’s good news though! If that should ever happen to you, read on, and we’ll teach you how to grind coffee beans without a grinder using a variety of different, simple methods. Don’t let the absence of a grinder keep you from enjoying your morning cup of coffee goodness. For every problem, there’s a solution, and in this case, more than one! As mentioned above, the overall best way to solve your problem of having fresh beans but no grinder is to head to your local coffee shop (or a grocery store with a grinder) and ask if they can do it for you. That way, you get a high quality, consistent grind that will tide you over until you can get access to your grinder again. If you don’t own one, you should. You can pick them up for next to nothing at just about any pharmacy, and they’re pretty handy to have around, and not just for coffee. 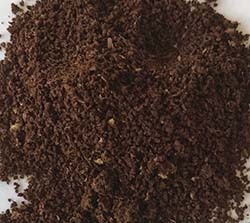 Here, you’re not so much grinding your beans as smashing them to powder, and the trick here is not to get carried away. If you’re not paying attention, you can crush the beans so fine that you essentially wind up with Turkish coffee, which most coffee makers and espresso machines can’t handle. 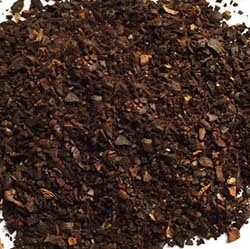 Result: You’ll wind up with a cup full of coffee grounds, which probably isn’t what you’re looking for. 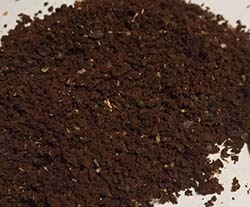 It does take some practice, but in a pinch, this is probably the easiest and most straightforward way on how to grind coffee without a grinder. Hammer Time (Break It Down)! 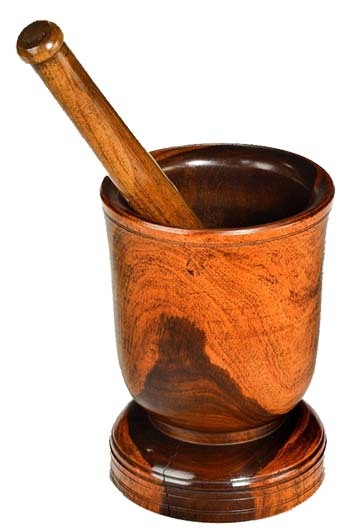 If you don’t own a mortar and pestle, you can accomplish the same thing by tossing your beans into a Ziploc bag and breaking out a hammer or meat tenderizer. Place the baggie with the beans onto a cutting board and start hammering. You won’t get a very consistent “grind” in this manner, but it’ll work in a pinch, and doesn’t take as long as using the mortar and pestle approach. Pro Tip: If you’re out camping, and don’t have access to a hammer, you can accomplish the same thing using any available flat rock or log in the place of a cutting board, and any medium-sized rock that will fit in your hand in the place of a hammer, or, if you brought a cast iron skillet with you, that’s got enough heft to work well too. It’s crude but effective. Some people just can’t bear the thought of that loud hammering sound first thing in the morning, and if you cringe at the very thought of that, then a rolling pin gets the job done much more quietly. Here, the Ziploc bag is optional but still recommended. 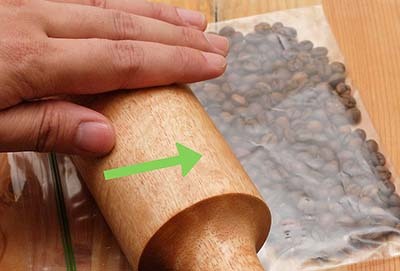 As with using your trusty hammer, just place the beans on your cutting board and apply a firm, consistent pressure with the rolling pin, crushing the beans beneath it. 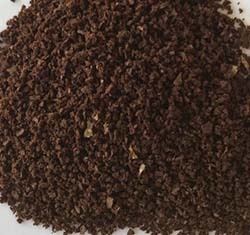 Again, don’t expect much in the way of consistency here, but it’s another dead simple method of “grinding” coffee beans without a grinder that will see you enjoying your favorite early morning hot beverage in no time. Our Personal Favorite – A Pepper Mill! Lots of people have simple pepper mills in their homes. In fact, you can even buy cheap little plastic ones at most grocery stores. It’s as simple as emptying it out, adding your beans, and grinding away. It’s slow going, but you’ll get a more consistent grind for your efforts. Note: Depending on the mill, you may need to give the beans the “hammer treatment” to crush them down to size before placing them in the pepper mill, making this a two-step process, but again, using a pepper mill to grind coffee without a grinder gives you fairly consistent grounds, making it worth a bit of extra effort. If none of the manual options sound appealing to you, and you’ve got a blender or food processor close at hand, break it out, plug it in, load your beans and blend your way to ground coffee. 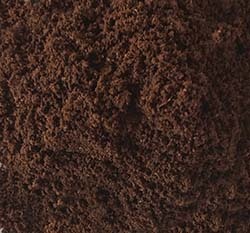 Note that this essentially turns your blender or food processor into a blade grinder, and while we don’t recommend using bladed grinders because they produce highly inconsistent grounds, it’s better than nothing, and is a fast, effective way of turning your beans into something you can put in the coffee maker of your choice. For your convenience, we’re also including our handy guide chart on how to grind coffee beans without a grinder. Since you’ll have to be eyeballing your grinds, this chart should help you get more consistent results, based on the brewing method you’ll be using. You can also use this as your personal grind chart by completing the last column (i.e. 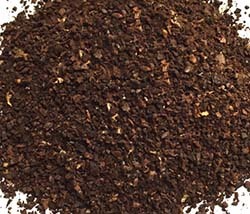 Your Grinder's Setting) and entering your own grinder's setting that produces the respective grind. Pour out some kosher salt onto your counter top. 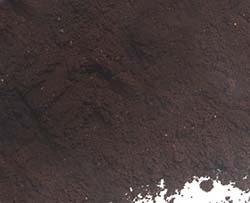 That’s what extra coarse grinds should look like. Very large, clearly defined particles. If you’ve ever done any canning, then you’ve probably used slightly finer kosher salt than described above. That’s what a coarse grind looks like. The particles are smaller, but still impressively sized and clearly defined. This is a very gritty grind, similar to coarse sand (not beach sand, which is significantly finer). The best comparison here is table salt. It has a gritty appearance, but actually feels fairly smooth when rubbed between your fingers. If you add sugar to your coffee, that’s what this should look like. About the same size and consistency. Slightly smaller particles than salt, and having a smoother feel when rubbed between your fingers. Slightly smaller grains than the sugar you add to your coffee, with a smooth feel. You should still be able to feel the individual grains though. Done well, this should have the consistency and feel of powdered sugar. You should not be able to detect individual grains. Maybe you’re traveling and just forgot to pack it. If you went camping and forgot to bring along a manual grinder. Your grinder was working fine yesterday, and today, it just…isn’t. Whatever the reason, now you’ve got multiple ways of solving that particular problem. Drink up and enjoy!